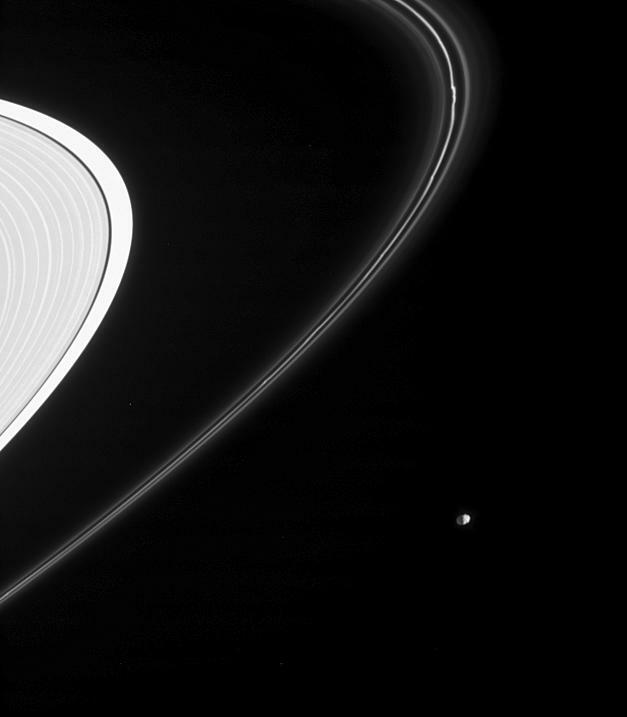 Saturn's moon Epimetheus is seen here from just beneath the ring plane, along with Saturn's intriguing F ring. The bright, knotted core of the F ring is flanked on both sides by thin, dusty strands. The outer part of the A ring is visible at the left. Epimetheus is 116 kilometers (72 miles) across. Part of the little moon's night side is illuminated by reflected light from the planet. For a closer view of Epimetheus see PIA06226 . The image was taken in visible light with the Cassini spacecraft narrow-angle camera on June 30, 2005, at a distance of approximately 1.8 million kilometers (1.1 million miles) from Epimetheus and at a Sun-Epimetheus-spacecraft, or phase, angle of 93 degrees. Resolution in the original image was 11 kilometers (7 miles) per pixel.